Liberal Bohemian: It sure is starting to look a lot like Christmas. Good Day for daughters. I'll say. December 13th, is not only the very lucky number 13 which is known as the Devil's dozen used by witches as a parody of the 12 disciples of Jesus, but also, a very special day in Sweden known to some as the Sweden Christmas. Saint Lucia's Day; however, has nothing to do with the Santa Christmas. It is a festival observed throughout Sweden in which the first-born daughter of each family wears a flowing white gown and a crown of candles around her head, obviously in reference to the ancient Pagan symbols of fire and life-giving light. 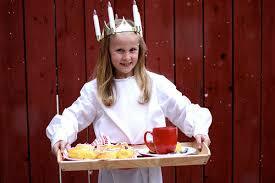 The daughter traditionally serves her mother and father breakfast in bed.